Exciting news! This blog, with 49 posts, has already surpassed my old blog, with 159 posts, in terms of total pageviews. That happened much more quickly than I expected it to. Also, Soulwoven is now RANKED on Wattpad (#94 in Fantasy and #134 in Adventure)! I would eat a gummy worm in celebration, but I decided to be good today and not buy the 3 lb. bag of them that I saw on sale. Right. On to a breakdown of Chapter Two of Soulwoven, which has now been up on Wattpad for a week. If you missed it, you can find the breakdown of Chapter One here. Chapter Two is one of my favorite chapters of Soulwoven, mostly because I get to describe Eldan City for the first time, and because we get into Cole's head, which is a place I really like to be. Unlike Chapter One, Chapter Two takes place in one, unbroken scene. We start off in Cole's head as he and Litnig are leaving their house and stick with him as they discover that the Old Temple has been broken into and there's been a slaughter in the graveyard behind it. The chapter ends when the brothers find Ryse lying untouched in the midst of all the grisliness. I'm doing several important things at once in Chapter Two. First, and most importantly, I'm letting the reader get to know Cole, who shares main character status pretty equally with Litnig in the book. Second, I'm continuing to develop the world. Third, I'm introducing several new sources of tension. And fourth, I'm showing the reader the alternating point of view structure that will continue throughout the book. The continuing introduction of Cole takes place mostly through his narration. The point of view is very limited third person, so the reader only sees the world through Cole's eyes. And because Cole has opinions about everything, the reader gets to see a lot of them through his internal monologue. This chapter also provides a bit of a crisis point for Cole. On the one hand, he wants to help people, like his brother does. On the other, he's much more realistic about his own capability to do so, and he knows it won't help anyone if he gets himself hurt or killed. The second part of his brain tells him that the chances of he and Litnig doing anything useful are low at best and that they should clear out and keep themselves safe. But that part of him is wrong. Nothing bad happens to them. And Litnig is able to help Ryse. So in the back of his mind, Cole knows that if he had gotten his way, his friend and a bunch of innocent people would be worse off, and he and his brother wouldn't be any better off. Characters being wrong about important things, in my experience, almost always makes for an interesting situation. At the same time I'm developing Cole, I'm continuing to work on Litnig. One of the reasons I chose the alternating point of view structure is because it offers incredible opportunities for character development. We've just had a chapter where we're in Litnig's head, seeing the world as he sees it. Now we get to see the world, including Litnig, from another point of view. Every time Cole describes Litnig, we learn a little more about both brothers, because we get to compare what we know is going on in Litnig's head with what Cole thinks is going on in Litnig's head, and we get to see what Litnig is doing without seeing his rationalizations on top of it. The worldbuilding takes place primarily through Cole's descriptions of the city. The fact that Cole loves Eldan City helps with that. The city, and his relationship with it, are a big part of who he is. So it makes perfect sense for him to be thinking about what Temple Hill looks like, or how the River Eld smells, or the festivals and the Temples. Those are the things he thinks about every time he leaves his house. He's also among the smartest characters in the book. He connects old information with new information more readily than his brother, and he has more experience with violence, which makes him better equipped to describe the action in this chapter in particular. Trying to do the same descriptions through Litnig's point of view would be more difficult because he just doesn't see the world in the same way. As for tension, right off the bat, we have the lingering question of why Cole decided to come with Litnig. That's resolved fairly quickly---we learn that he had a nightmare too, and he wants to get away from it. But he also feels less than convinced that it was a normal, run-of-the-mill nightmare, which continues to build tension around Litnig's dream and the events connected with it in the first chapter. On the heels of that, the brothers see the murdered guards at the Old Temple, and the tension comes from a new angle, because we know that Ryse is inside and we suspect the brothers are going to go in after her. That question of, "Where is Ryse, and is she ok?" keeps tugging throughout the chapter, but there are other questions that start to crop up around it, like "Where did all these bodies come from?" "Will Litnig and Cole be able to help anyone?" "Are the people who did this gone?" and "Where did they come from and what did they want?" At the end of the chapter, the brothers find Ryse, but the question of whether she's really okay (Cole certainly thinks she isn't, but she and Litnig are acting like she is) remains unresolved, which I'm counting on to get the reader to turn the page again. On top of all that, there's tension between the brothers. Cole doesn't want to be there, but he won't leave Litnig, and Litnig takes advantage of that to drag him into a dangerous situation. It's one thing to put your own life in danger. It's another thing entirely to feel like you've been dragged into it by someone else. That's a theme that will continue throughout the book. To be honest, there isn't a lot I don't like about this chapter. On a sentence to sentence level, it's still not perfect. My writing isn't at the level of someone like China Mieville or Neil Gaiman. But the voice holds up okay, I think, and I'm reasonably certain I've done a good job of getting the big things right. 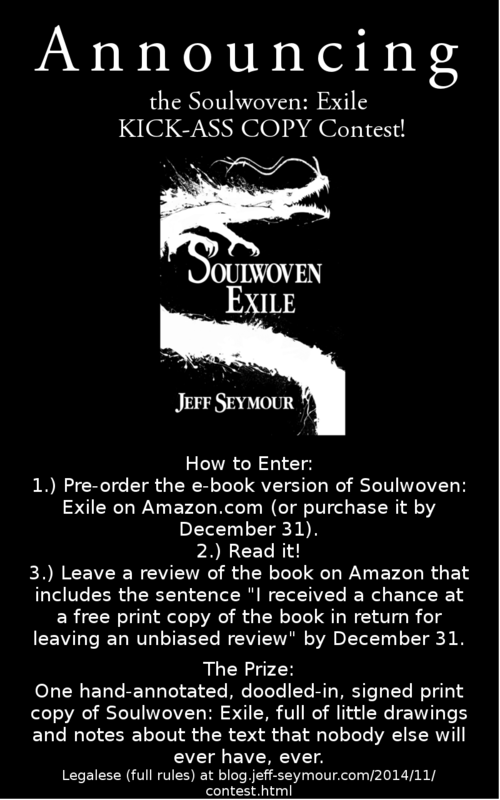 Chapter Three of Soulwoven, in which we get Ryse's point of view and the questions of "Is Ryse okay?" and "What did the people who did this want?" are resolved, goes up on Wattpad tomorrow! Check my Facebook page or Twitter feed for a link sometime in the afternoon.